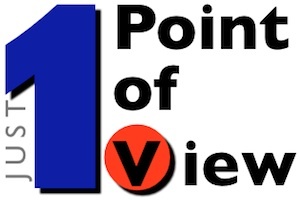 Just One Point Of View [justonepov.com]: My Ford Escape Hybrid Brake Repair Experience - The Brakes Broke the Bank! My Ford Escape Hybrid Brake Repair Experience - The Brakes Broke the Bank! 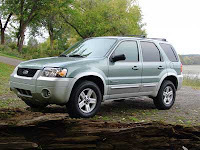 I have owned my 2005 Ford Escape Hybrid since the autumn of 2004. It was one of the first few Escape Hybrids that were made available in the Washington DC metropolitan area and I was very excited to take delivery. As a long-distance commuter from Northern Virginia into the District of Columbia, owning a hybrid electric vehicle ("HEV") provides certain advantages to those of us who travel on Interstate Highway 95 / 395 each day. You see, the Virginia General Assembly approved a limited exemption for HEVs to use the high occupancy vehicle ("HOV") lanes as a single-driver for the morning and evening commutes. That perk saves me hundreds of commuting hours a year, and the fuel economy savings are an added bonus. A job change during the last year has allowed me to work from home on most days, so the first 100,000 miles were all in the initial four years that I have owned the Escape. It may come as no surprise that not long after breaking through the warranty threshold (3 years or 36,000 miles) I experienced an unusual problem with the brakes. In what seemed to be a very random circumstance, the yellow ABS and the red brake warning lamp lit and the alarm sounded. The brakes reverted to fail safe mode requiring a "pedal to the floor" effort to slow the vehicle to a safe stop at the side of the road. Not exactly comforting. Interestingly, after shutting-off the vehicle and restarting, the brakes returned to normal operation. A talk with the Ford service manger revealed nothing. The problem did not happen again and the dealer was not aware of a brake problem. I wrote it off to gremlins and continued to drive safely for the next few months. However, once in a great while after that, the problem would reoccur; yellow ABS light, red brake warning light, audible alarm and brake pedal to the floor. The Ford dealer claimed no knowledge of a problem and it could not be reproduced. My mechanic and I decided to follow the TSB advice and replace the master cylinder with the revised part. It seems that this is no ordinary master cylinder. 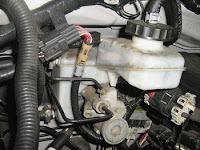 The Escape Hybrids use an electro-hydraulic brake ("EHB") system. Because of the regenerative braking action of the HEV, the EHB system does not have a traditional master cylinder with a mechanical vacuum brake booster. The special master cylinder comes with a special price tag: $1,292.31 from Ford and a couple of hundred dollars to my mechanic to install. With great hope that my brake problem was resolved, I drove the Escape home only to have the problem occur again several hours later. 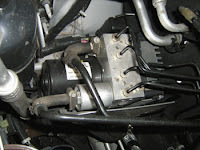 I immediately took the vehicle back to my mechanic and after reviewing the trouble codes, we discovered that installing the new master cylinder had now revealed what the real problem apparently was; the brake system's hydraulic control unit ("HCU"). If you own an Escape Hybrid, you have probably heard the HCU in action. Whenever you unlock or open the door, or switch-on the ignition key, the HCU module tests the brakes by pressurizing the hydraulic system. Four minutes after the key is switched off, the HCU discharges the pressurized fluid back into the master cylinder reservoir. Listen for the hum of the hydraulic pump if you have never noticed before. With the HEV's regenerative braking system, the HCU controls braking by using the electric motor as a generator to recharge the batteries; the traditional friction brakes actually provide very little of the stopping. Once stopped, the HCU allows the traditional brakes to simply keep the vehicle from rolling. As you might suspect, the HCU is an integral component of the electro-hydraulic brake system and works in conjunction with the master cylinder to provide the regenerative braking and antilock braking system ("ABS") action. The HCU is an important component of the braking system, so it carries a premium price tag. My cost from Ford? $4,587.17. Ouch! To make matters worse, bleeding the brake system of air after replacing the HCU requires special training and equipment. That's another $494.59 from Ford on top of a few hundred dollars to my mechanic for his time to install the new HCU. There is no obvious way that I could have damaged the HCU with my very normal driving habits (i.e. no history of towing, long downhill braking, hard braking or urgent stops). The vehicle has never been involved in an accident that may have affected the device, and the HCU is not a component that should be susceptible to wear to the point of early failure. I believe that the Escape Hybrid's regenerative braking system, master cylinder and HCU are defective by design (hence the TSB) and the fault lies with Ford Motor Company. I consider this brake failure very serious and remain surprised that it is a problem that Ford had never bothered to notify me about. They certainly had no problem sending me loads of marketing material to buy a new car. My attempts to get Ford's attention on this matter have fallen on uncaring eyes and ears. To summarize my correspondance from Ford... Since the National Highway Traffic Safety Administration ("NHTSA") is not concerned (i.e. nobody has gotten killed by these defective brakes) there is no need for a recall. Therefore, Ford has no responsibility to pay for or deal with my problem. Well, thank you very much! I do not understand how Ford can claim no responsibility for this very serious and significantly dangerous issue with the vehicle's brakes. Unfortunately, this blog post may not offer much help to the reader other than to warn you of the problem that you may be facing with your Ford Escape or Mercury Mariner Hybrid, and to possibly prepare you for the extreme sticker shock of the repair bill. Maybe YOU will have more luck getting Ford to pay your repair cost. In my case, the cost to repair the brakes was unfortunately necessary. I need the vehicle for transportation to work, it was not safe to drive without the repair, it had no value being broken, and I did not have the conscience to sell the vehicle with this very dangerous problem. This experience has certainly soured my opinion of the Ford Motor Company. Although I have enjoyed owning several different Ford vehicles, their failure to proactively address this safety issue is rather appalling. I will not buy another Ford product after they have abandoned me with this ~$7,000 bill to repair a problem that is solely related to their poor design. [Postscript (February 8, 2010): I received a nice phone call from a young woman with Ford Customer Relationships. It seems as though they had read this blog and wanted to speak with me. I'm really not certain why, because in the end, they really offered me nothing more than an apology. It seems that it's Ford's expectation that the local dealer's service manager should have told me about the TSB when I had the vehicle in their shop for other work (He didn't.). It was also explained to me that I should have received a notice in the mail about the TSB (Not sure about you, but I have never received a notice about a TSB from any vehicle manufacturer. Marketing material, yes. Recalls, yes. TSBs, no; and certainly not from Ford for this particular brake problem.). The Ford representative also suggested that had I come to them earlier (i.e. When the vehicle had fewer miles and before I had the dangerous condition repaired myself), they may have offered me some type of financial assistance to complete the repair. However, since I didn't, I am out the total repair costs myself. Frankly, I find this statement very difficult to believe. And why couldn't they offset some of the cost now? I have all of the receipts to prove that the repair has been completed using the recommended parts purchased directly from Ford. The young woman from Ford Customer Relationships was very pleasant and I know that she was simply doing her job. I am grateful that she phoned me, but nothing has changed. Ford still has a very dangerous situation with this brake system failure. A failure that is by all indications a design flaw. A failure that the NHTSA has yet to take any meaningful action on. A failure that Ford has really not taken any responsibility to make right with their customers. In the end, I am still out ~$7,000 to address Ford's design problem, just to make my Escape Hybrid safe to drive. As I explained to the young woman; I have owned Ford vehicles for many years, starting with a 1975 Thunderbird. They have all been fine, serviceable vehicles. Based on my experience with this Ford Escape Hybrid, it will be my last Ford vehicle. [Editor's Note: I received an anonymous comment suggesting that I am crazy for expecting Ford to make good on an out-of-warranty repair. To that comment, I reply that I am certainly not crazy. This brake failure is not due to a wear-and-tear drive train component. We're not talking about a wheel bearing or exhaust pipe. This is about the critical failure of the regenerative brake system; a failure acknowledged by Ford mere months after the vehicle was manufactured (Reference TSB 05-8-5). A component failure that is not due to driver-induced damage or wear, but a design flaw. If my use of the vehicle were the cause of the braking system failure, I would accept the responsibility to pay for the repair. However, in this case, the manufacturer is clearly liable and should be responsible for making certain that the vehicle is safe to operate. This same exact thing happened to a co-worker of mine who drives up a couple times a week from Richmond to McLean in 2009. I am pretty sure he even said the cost to fix was $4500+ in parts alone - he opted to scrap the Escape and bought a Prius. I'm driving a 2005 Ford Escape Hybrid too, purchased in late 2004, and today my ABS & BRAKE lights came on along with the "Service Brake System" message and the dreaded "manual mode" braking. The service department at my local Ford dealer says, "needs a new master cylinder", and they were aware it's a revised part. I'll find out later this week if the new master cylinder solves the problem -- so far there's no indication it's an HCU issue. Like you, I'm disappointed Ford hasn't addressed the brake problems proactively. Early adopters of Ford hybrid technology took a substantial risk and now that problems have cropped up as a result of faulty design Ford is ignoring their customers. Although I've been happy overall with my Escape Hybrid, I won't buy another Ford vehicle until they fix the problems with the one I have. Follow-up: My local Ford dealer installed a new master cyclinder in my 2005 Escape Hybrid and so far that has resolved the problem without needing HCU replacement. They also gave me a substantial discount on the ridiculously overpriced $1200 master cylinder, which indicates that dealers have some discretion in how much to charge for the part. I just had the same problem described above -- yesterday. When my dealer called to tell me the repair bill would be over $4,000 I nearly screamed and fell over. I'm trying to decide what to do now -- get rid of the car, or bite the bullet. Is there any place to buy a replacement HCU? We are also dealing with this right now. Had the on and off again brake light and then they went out completely this week. We are also looking at a 4k+ repair bill for the HCU and deciding what to do about this is very hard. This is really upsetting to me and Ford needs to take some responsibility for this! I had the exact same problem with my 2005 Escape Hybrid back in 2007. I took info I had collected from the internet about the problem and was told there was nothing wrong and that they had reset the computer. Several weeks later the exact same thing happened. Having a wife and two kids, I cannot have a vehicle where the brakes don't work intermittently. Needless to say, went straight to the Honda dealer, bought a Pilot and am able to stop when I apply the brakes. I files every complaint that I could find on the internet. Someone from NTSB sent me an email in January inquiring about the problem. I sent an email back but haven't heard anything since. I think there is some exaggeration with this whole ford hybrid brake issue. At no point does the driver lose the brakes. Its a software issue meaning the light is coming on, its not a mechanical issue. that is why they are wanting owners (like my self) to come in so they can turn off the light. its nothing at all. media just loves to blow s*** up and make it bigger than it really is. sorry cool...but when you completely lose all power assist to brakes and abs function , it's not just a "software issue"
"Cool Classic Cars" - Trust me, it is not an exaggeration. The regenerative brakes on my EHV resorted to fail safe mode at highway speed in traffic, which can only be described as pedal to the floor panic for the driver. When the HCU failed, my only reliable way to brake was to use the mechanical emergency brake. My mechanic and Ford confirmed that the problem was the master cylinder and HCU. There was no software issue. It is a significant matter that could have resulted in a severe injury to me or the occupants of another vehicle. I have a 2009 Ford Escape Hybrid and have 24,870 miles on it. It's our family car and we drive everywhere. I'm glad I found this blog because my brakes went out on me on Friday (April, 9). I was driving into a parking garage and as I pulled in, I drove over a puddle. My 'check break system' light came on as well as my emergency break light. So I thought oh it's a sensor...drove over the water it'll be fine. Well, I'm driving up the parking garage and I'm tapping my breaks to make sure my breaks are still working and they are. As I pull into the parking space, I tapped my breaks to stop and my car keeps going. My breaks went out b/c has I tapped the break, it went to the floor. So I hit the concrete wall of the parking garage. I had my 18 month old son in the car with me. It scared me. So I didn't drive my car again for fear my breaks go out again when I'm driving and I have my son in my car. Called Ford Road Side Assistance, towing covered under my warranty. It was quite interesting how the tow company was going to try and get my car out the parking garage when the tow truck was too high to drive into the parking garage. The car is at the dealership now. Won't know anything until Monday when their "Hybrid Specialist" is there. The front bumper is scratched. No dents on the bumper...thank goodness and the air bags didn't deploy (was going less than 15 mph). Thank you for posting this information. I, too, have a 2005 Ford Escape Hybrid and am experiencing the same problems (began 3/31/10 reoccurred 4/9/10). Spent $1000 yesterday as my dealership decided to claim it was the rear A/C evaporator core failing. My husband drove the car home and had the same thing happen to him (ABS/Brake lights/alarm) except instead of total brake failure which I had, the brakes are now thumping and shuddering. I filed an NHTSA complaint - thanks for the link. And will deal with Ford on Monday with the HCU information that everyone has provided. I take offense to Cool Classic Car's write off of this - my husband & I are commercial fisherman with plenty of driving/hauling/towing experience so we know when it's a real problem. The frightening thing is we live down a 1500 foot curving mountain road in Hawaii. "Fortunately" the failures have happened towards the bottom where we have some flatter areas to coast to the side. Higher up the hill, neither of us would still be here! I sympathize with your situation - although I believe that Ford makes the best American-made cars, I have found their dealers' service departments to be poorly informed and not at all proactive. But I have to join in with some posters who question how you handled the problem and can see Ford's side in not jumping in to help. You say you first experienced the brake problem shortly after 36,000 miles. Then you let it go as you drove almost 50,000 more miles without seeking a second mechanic's opinion or doing additional research - how serious could the problem have been? Then, after getting your answer, you drove ANOTHER 20,000 miles before acting on the information you had found. The car was obviously serving its purpose, and honostly all SUVs (hybrid or not) start to hit major repair tags after 100,000 miles. I would expect a manufacturer to stand by its product and pay for a costly repair in the first years/miles after a car is purchased, but after 100,000 miles I'd also be tempted to tell a driver that he'd gotten his money's worth and needed to expect a car that old to require an investment to keep running. You got way too many miles out of that car to justify calling it a lemon. It happened to me last Wednesday. Fortunately I was going slow and uphill in my 2008 Mercury Mariner Hybrid. The killer is the 36,145 reading on my odometer. $1400 for the master cylinder and so I've left a voicemail for one of the dealership owners. This just isn't right. Wish me luck! I own a 2006 MMH and had a similar issue last year. Fortunately my vehicle was still under warranty so the money did not come out of my pocket. It was an inconvenience to be sidelined without a car for some days but I guess I can live with that given some of the other posts here. I apologize if my post was not clear, so please let me clarify. I communicated my problem to Ford on a number of occasions, well before I had more than 100,000 miles on the vehicle. Three different dealerships serviced my vehicle before I had surpassed 50,000 miles, and many months after Ford had already issued the TSB about the brake problem. None of the Service Managers from the three different dealerships brought the matter to my attention, and all of them refused to believe that I was experiencing the brake problem that I described to them. It is my opinion that seeking the advice from service departments from three Ford dealerships, who apparently failed to even search for a related TSB, qualifies as proactive and timely on my part. There is no doubt that this vehicle, absent the severe problem with the brakes, is a good vehicle that has served me well. As I stated in my original post, the Escape has required very little work outside of normal maintenance; and besides the very poor seating quality, it has been a very good vehicle for me. I have never suggested that the Escape Hybrid is a lemon. What I have stated is that the Escape Hybrid has a serious defect with the regenerative braking system. A malfunction that is design related (not caused by wear and tear), and was known about by Ford mere months after the vehicle was manufactured (Reference TSB 05-8-5). I stand by my position that this defect is very dangerous, and that Ford should have taken proactive action to address the matter. Apologies, my last comment was in response to Anonymous, April 11, 2010... not Anonymous, April 13, 2010. Sorry for any confusion. This happened to me yesterday - completely lost brakes on my 2008 Escape Hybrid. Any idea if it is covered on the 36,000 or the 50,000 mile warranty? I know different parts are under different mileages. I'm just under 3 years, but at 48,000 miles. Thanks for this info- intersting to find out that this is happening to others as well- I have a 2007 Escape Hybrid that started with these major issues last week- they are currently recomending replacing the master cylinder. If you are able- where can I find the tsb info? For those who have asked about obtaining the Technical Service Bulletins ("TSB"), please note that these documents are normally not made public by Ford. They are available to Ford dealer service departments. Hello, I recently bought a 2005 hybrid with the same issues but it is still covered by a warranty from the bmw dealership from which I bought the vehicle. The vehicle has only 27000 miles nd I don't know if it is still covered by ford warranty. Can you please advise me on what to do? Siva - We cannot provide vehicle repair advice. However, if you are experiencing these same brake problems with your Ford Escape Hybrid, we suggest that you return to the dealership where you purchased the vehicle as soon as possible. Provide them with the information about the Technical Service Bulletin and see if the warranty covers the very expensive repair. This situation is much too dangerous to not be addressed. This is siva again. What dealership did you go to get it fixed. I am from the dc area as well. Siva - After three different Ford dealerships failed to address my issue, I had a qualified, independent local mechanic repair the problem. I have been told "off the record" by mechanics who worked at Ford dealerships that the Service Managers would purposely not inform customers of TSBs that affect their vehicles in order to avoid the time and expense of performing warranty work. Based on this information and my own experience, I refuse to have any non-warranty work done by Ford. They obviously don't care that much about their customers. Your 2005 would no longer be covered by the original warranty, so there is no need to return to a Ford dealership unless you just want to see if they will address the problem in an honest and forthright manner like they should. Another FEH owner (2005) with the same problem here. Beep, ABS goes out and I'm in failsafe mode. Occasionally, while I'm turning, the ABS will go nuts clattering on and off before ABS goes out, but then I'm on the traditional breaking system. Since I'm aware of it, I'm fairly comfortable driving the vehicle. Won't let my wife or neice drive it though. Still, it stops fine in failsafe mode. I don't have the $$ to fix the problem so hopefully Ford pulls their head out and provides some relief. Thanks for starting this blog! I also have a 2005 Escape Hybrid and the same thing is happening to me now. What I first noticed was the warning light that tells you that the car is skidding comes on and the car literally skids to a halt. Even when the car is going 5 mph and you are gently rolling up to a stop sign, it still skids as if you were doing 80 on a sheet of ice. Scary. Then today, I was pulling out of a parking space and had not even stepped on the gas pedal yet when the car began to skid and shake like the brakes were being pumped. Now the ABS light is on. There is absolutely no way that this is driver error. And there is no way I have the funds to cover the cost of what Ford should be recalling and repairing themselves. Looks like I will have to sell and buy another make and model. But who do you sell to with such a costly repair is needed? Looks like I'm getting ready to go down this rabbit hole. Thank you for all the warnings and information. The price tag they are quoting me is $6500. Seems like a lot on a car that has never had a single problem. It just flashed this message, "Stop Safely," then another message right after,"Service Brake System." It was late Saturday when this occurred so going to the dealership was not an option, as its not an option today...its Sunday and it happened again just a minute ago...would not start, flashed the same error messages. It started again when I turned the key to the off position and back to the start position. Does anyone know if Ford has issued this "report" on the 2006 Ford Escape Hybrid model also? We are still under warranty but it will soon be out of warranty in 20,000 miles or less so we would like to take it in and have it serviced. I'm afraid their going to try and rip us off by their "fix the cheapest thing first" tactic...then over the next couple months fix the next in line in cost, resulting possibly in us going past our warranty. I'm also alarmed that they will try and reset the computer or just disconnect/cut the wiring to the warning code all together..."covering their tracks," by making it look as if there was no problem...only prolonging this issue and keeping them from honoring the warranty when we go over on the mileage. I've got to thank you folks for sharing your experiences and cluing us in on the tactics on part of the dealerships and costs of this apparent safety issue. Please if anyone knows if Ford has released this report on the 2006 Ford Escape Hybrid...please let me know! A simple "Yes" typed into this blog would be sufficient. And even better a link to find the "report" would be a God send! I imagine that having this document would save me a very stressful altercation with the profit protectors at the dealership tomorrow. Ive kinda searched that site and haven't found the report for our vehicle...but I think I'm searching wrong because I cant find the report even when I search the original posters TBS report...so it makes me think I'm searching wrong. Unlike many "posters" here..I WILL do a follow up comment on what our problem was. Please...any help? There are some listed for the brakes, although I don't know if it is for the problem you are experiencing. For FEH owners with different year vehicles, you can use this same site to search for TSBs that may affect you. Add me and our 2006 Ford Escape Hybrid to the list. I'd just taken our vehicle in for its 40k mile service and it had no issues, and we've never had issues with its brakes or other systems. Two days after the 40k mile service, though, I was driving home and I got the beep + amber ABS warning light + red Brake(s) light lit up...and almost no braking power even with my foot to the floor. Needless to say it was not a fun drive home, braking five times earlier and longer (foot to the floor the entire time) than I normally would, driving in Low gear when possible to make it easier to slow when I let off the accelerator, and with my hand covering the parking brake in case I needed to engage it if all else failed. I have a 2006 FEH and have experienced this problem three times. The first time the dealership replaced a sensor. The second time happened on a Sunday in my driveway. So I didn't drive the car with plans to have it towed to the dealership on Monday. On Monday, the message was gone, and the brake worked fine. Yesterday, while driving, the braking power was lost and the ABS and service messages appeared. Today, my dealer says the master cylinder needs replacement. Nothing has been said so far about the HCU. Has anyone with the 2006 FEH needed this replaced? By the way, all of these occurrences of loss of braking power happened on very hot days. I had to have my 2006 FEH master cylinder replaced@46,000 miles and the battery, but atleast I had the extended warrenty. I will trade in next fall and will never buy ford again. Have a Ford 2006 hybrid. ABS and brake light came on. Have to have the HCU replaced for $5000. 53,000 miles on it. I have a 2008 Ford Hybrid Escape same issue. Just had the master cylinder replaced one month ago. Just had the regen. brake failure light come on again. I'm about to take it back to the dealer and suggest they take a look at the HCU. This isn't some software glitch like an earlier poster stated. You still have manual braking power, but you pretty much have to put the pedal to the floor to get the vehicle to stop and it is definitely only a matter of time till someone actually gets hurt. It's a shame that manufacturers become so cheap with out of warranty repairs. I actually worked as a warranty claims specialist for Nissan. They actually were pretty good about it, if it was an issue such are yours. I have had similar problems with Ford's service, though in Canada. My 2005 Escape hybrid has required the following repairs, post-warranty: steering column computer replacement (TSB, but no recall=my cost of over $1000---I was one thousand kms over warranty coverage), coolant pump malfunction, a/c malfunction (necessary fix as the hybrid system requires a/c system), wheel bearings, control arm and ball joint, annnnnnnnnnnnnnnnd an ENGINE. Not only have I had to pay for all of these fully out-of-pocket, I have also discovered that Ford seems to issue recalls that it then forgets. They have no record on their system of recall notices I have received in the past. I have had to read them their recall notices, and they cannot find them. Never a Ford again. Never. Since Ford has a 8 year, 100,000 mile warranty on Hybrid specific parts, shouldn't it be covered?? I would assume the HCU is hybrid specific??? I am showing symptoms that you have experienced with your escape. Anonymous: Ford representatives told me no... that the HCU is not covered by the warranty. Certainly worth a try on your part. Good luck! Am going through this right now. The ford 'customer relations' people are no help. I have the 100k warranty, as well. It is an absolute scam. Anonymous: We passionately encourage anyone having this problem to please file a complaint with the Office of Defects Investigation ("ODI") at the National Highway Traffic Safety Administration ("NHTSA"). If you have not already done so, you can file a safety complaint at this web site... http://www-odi.nhtsa.dot.gov/ivoq/ or by calling the NHTSA Safety Hotline, Monday through Friday from 8:00 a.m. to 8:00 p.m. at (888) 327-4236, TTY: (800) 424-9153. Thursday it acted funny on my lane / driveway. The next curve I found out why, no breaking power even with the pedal to the floor which was extremely stiff and difficult. I finally got it to a stop way past the crazy ride around the curve. I stopped to calm myself and decide if it was possible to get to town. I decided the E-brake seemed to work and proceeded -not to the closest Ford dealer because of some very scary big hills, but instead to the service station who I trust. He was booked a week and a half and he didn't know if his computer had the Hybrid programming to check it. So I had to tow it 63m to my dealer I got it from, thinking at this point they would stand by it or it would be covered by the "drivetrain plus" service agreement I purchased to cover any scary priced repairs that crop up on older cars (it is over 100k mi). Because it was sold as-is, and Iowa has no lemon law apparently, the plan I purchased sounds like it won't cover it and they offered me a measly 10% off the bill that is about half again what I paid for the car. I got to drive it 4 times. All I can do is thank my lucky stars my kids weren't in the car, there wasn't a car, I wasn't coming down one of the steep and curvy river bluffs on my way to work, or any number of scary scenarios that could have been. The idea break failure has to end in bodily injury and death to deserve a recall is horribly negligent on Ford's part. I found out this is a serial defect for these because I had repair sticker shock and wanted to do a little research to see if I was being taken, now I find I'm one of many victems of this horrific defect. THANK YOU,KEN YEGALSKI! my 2005 has done this and it just started doing abs light on, service brakes and it also is doing things a person said thier escape is doing now if ford tells me my ex war does not cover this this will be the last ford i ever own! thank you again for this post now i know I'm not crazy. and i will see how much my dealer wants to keep me as a ford owner. and how turthful they will be on this problem. I LOVE YOU!!!!! I've got 410 miles left on my warranty and this happened today. I thought to check online if it was a common problem and I found this. I already felt as though my local ford dealer's service was inadequate so now when they tell me there's nothing wrong with the car, I'll be prepared and know what to tell them. I'm glad I read this blog! I have been shopping around for an eventual replacement of my manual transmission 1997 Honda Civic DX, which has 296K on it and runs very well (that includes the transmission and engine). My friends keep telling me to buy a Ford Escape Hybrid so braincase will ride higher in my car, out of the way of engine blocks of Ford F350s that could smash my skull. After reading this, I'm not so sure the Escape will solve my problems! What if my Escape brakes fail and I plow into a cute lady in a Honda??!! My 2005 Ford Escape Hybrid is in for repair as I write this for this same issue. I had it in several months ago and complained that the brake pedal would intermittently get stiff and be a little grabby, scaring me more than anything. Then one day the ABS light came on, service brake system message appeared and pedal to the floor to stop. Turned it off and on it was fine. Took it to the dealer and all they did was "reprogram" the brakes and clear the code. Drove it from Ohio to Tennessee and back without a problem until I got home and the original issue reappeared. Then just this past weekend ABS light, warning message, pedal to the floor. Took it to another dealer by my home and they are replacing the master cylinder. I sure hope this fixes the problem. They did say if this doesn't fix it then the HCU and possibly the ABS module may need to be replaced. The latter I think has already been replaced (under warranty). My Escape has about 85,000 miles on it. Thankfully I was going about 35/mph and not on the highway both times the brakes failed. Experienced the same problem on our 05 FEH. Two lights on, severe brake grabbing problem. Dealer estimates $5200 to fix with vehicle down for a week. Module needs replacement. In my opinion a design flaw, only 80,000 km on clock. Having the same problem on our 2006 FEH with 101k miles. It started with a couple of incidents of "Service Brake System", but the brakes still functioned. I could tell they were not quite right, but the car still stopped ok. Took it to the dealer, who of course recommended the master cylinder and HCU for the bargain price of $5000. I am going to replace just the master cyl and see if that solves it. I got the car back from them and have ordered a master cylinder from an online parts dealer. 5M6Z-2140-B was $500 online vs $900 from the dealer. Installation was $700 from this dealer vs $400 from a dealer 1 town over, so I'll take the part and have the other dealer install. Then we'll see what happens. While I'm waiting for the part, I have continued to drive the car. Despite the lights, the brakes have always functioned...until last night. It had 2 incidents of no-braking-power; fortunately while I was in a mostly empty parking lot. I rebooted the car a couple of times and it was fine on the drive home. Drove in Low with my hand on the e-brake. I was holding on to the FEH until ford released the plug-in cmax. Now I'm not so sure about that. If only someone besides VW would bring over some nice diesels! I am having the same problem with my 2006 model. I was driving and the abs light came on and I started skidding over the road. I nearly hit a van! The abs control module cost 3,125.99 There has to be something I and we can do? IS THIS ONLY HAPPENING WITH THE HYBRIDS? I WAS PLANNING ON PURCHASING A 2012 FORD ESCAPE IN THE SPRING, BUT NOT A HYBRID, JUST A 4 CYLINDER FORD ESCAPE. Anonymous - The failed HCU component is specific to the regenerative braking system used with the Escape and Mariner hybrid vehicles. It cannot affect a vehicle with a traditional braking system. I was planning to buy a secondhand Ford Escape Hybrid 2006 model but based on what I read I'll have second thoughts about buying. I'm glad I read your article and researched before buying. Just had the drivers side brake line on our 05 crack and spew fluid. Only 55,000 miles on it. I have a 1995 Chrysler with 139,000 miles that has no problems whatsoever with brake lines. and a 1994 Honda with 150,000miles and never had problem one. Something is really wrong here. Looks like i'm dumping the escape before I have a problem with the HCU. #4- have you think they know what they're talking about. #2 - continue to thoroughly document your vehicle operation after the problem, until you get it to the service facility. #3 - go online and find groups and blogs like this and find other instances of your SPECIFIC problem, and corrective measures taken that proved to be proper and effective. #4 - INSIST that the "service writer" note your observations and suggestions (based on your research) and give them to the mechanic that works on the vehicle. #5 - INSIST to speak to the mechanic that will perform the repairs (install the replacement parts) before the work is done if there is any doubt about what may be the problem. #6 - get the name of that mechanic and keep it along with the reciepts for that service. If all goes well, use him again next time you have the vehicle serviced. Please use this blog or EscapeCity, or GreenHybrid to help others by informing them of your experiences. My wife and I bought a used 2006 MMH last spring. After noticing that there was a loud rattle coming from under the hood every time we opened a door (car parked and off), I took it to the dealership. They said that the HCU was malfunctioning and that it would eventually stop working= loss of regenerative braking and loss of ABS. Loss of regenerative braking would render the hybrid system useless. Quoted $4,600 to repair. Has anyone else experienced this rattling as if the ABS were being activated? Any idea how long we have until brakes (as designed to work) fail? Anonymous - Whenever you unlock or open the door, or switch-on the ignition key, the HCU module tests the brakes by pressurizing the hydraulic system. Four minutes after the key is switched off, the HCU discharges the pressurized fluid back into the master cylinder reservoir. Listen for the hum of the hydraulic pump if you have never noticed before. Apparently, in the case of your Mariner Hybrid, the failing HCU doesn't just hum... it rattles! I have not heard of this before your comment, and have no idea how long the HCU will last before failure. I have a 2005 Ford Escape Hybrid and I was having similar problems. About 2 weeks ago the ABS and brake light illuminated on dash but brakes still worked, just not like they were supposed to in ABS mode. I took it to local ford dealership mechanic yesterday and this morning he called me with the bad news. I knew it was going to be bad news when the first thing he asked me "was I sitting down"? He said the ABS Hydraulic Control Unit module had to be changed out and that part was $3100. There is no way I am spending that much money on a small part when I could almost buy a new engine for that amount. My plans are to sell the vehile ASAP and lick my wounds. What's sad is besides that it has been a trouble-free vehicle. It has almost 100,000 miles on it. This is what feared me the most out of a hybrid, the money you save on gas is spent on hybrid related mechanical problems such as this. Howard here, with an update. I found out that my problem wasn't so severe. Turns out there is a ring on the axel just inside the wheel. This ring looks like a gear. The ABS sensor uses this ring to determine whether or not the wheel is turning. On my FEH, this ring had broken loose from the axel and was spinning freely. I cleaned the ring and the axel of rust and debris and expoyed the ring back in place. My problem has virtually disappeared! And I didn't have to spend $5000! Yay! The only time I get an indication of any problem is when I slow down for a stop sign or light. The aforementioned ring is still missing one tooth (where it broke free) and occasionall this causes the sensor to hiccup. But it's infrequent and I'm used to it. If you have this issue, you might have Ford check out the rings to see if they have broken free and are spinning on the axel like mine was! They will probably charge you through the nose to fix it, but I'm sure it won't be as much as a hydrolic accumulator, $5k! Howard (02/10/2012) - See our blog post here [http://blog.yagelski.com/2011/07/ford-escape-hybrid-tone-ring-repair-yet.html] about how to perform a tone ring repair on the Ford Escape Hybrid. Any updates on this problem for newer Hybrid Escapes? We have a 2009 which seems to have the same problem! Anonymous (05/30/2012) - Based on complaints filed with the National Highway Traffic Safety Administration ("NHTSA"), the problem does not appear to be limited just to the 2005 model. Newer Escape / Mariner Hybrids seem to have had similar issues. Thank you for sharing your concerns and for the professional and insightful article. Your experience and those experiences posted on MyCarStats.com have assisted my decision to purchase a hybrid SUV. More, the experiences with Ford Motor customer service and support have helped me to rationalize the short list of manufacturers. Quality is not always Job One, and it takes the shared experiences of individuals and communities to highlight this... but how do we change attitudes before lives are put in jeaparody? I am just experiencing this same issue with my 2006 Ford Escape Hybrid. After being told by the dealership that they could replace the master cylinder for $1300 and that would not guarentee a fix. That many times, they would have to replace the HCU for another $4000 to fix it, I decided to just pick up my vehicle and go without the repair. My understanding is that the braking system would revert to a fail safe braking system, if the regenerative system fails. I guess I will have to put the pedal to the floor to stop my vehicle in the future. From Vancouver BC and it just happened to me last night on my 2006 For Escape Hybrid - I feel penalized for being an early adopter of the technology. I have driven the vehicle so gently since I have had it and had all services done on time at Ford - there is no logical explanation for a failure of this magnitude. It has to be a manufacturing/design flaw - I was feeling quite upset until I googled and saw this posting - thanks for the detail - at least I am not alone!!! Wow I was just looking at a 2005 FEH and was doing some research. Glad I found this blog. if the dealer can't tell me with 100% certainty that this was fixed on this car, I will not be buying it! vous me faites peur je viens d acheter un escape hybride de 2005 en france , il est deja en panne a cause de surchauffe moteur electrique !!!!! quand je roulais sur l autoroute. le vehicule s est mit en arret maintenance et le moteur c est arreté brusquement a 110 km/h. j ai attendu 1h avant de repartir et ca as recommencé plusieurs fois. maintenant il est chez le mecannicien et je n ai plus confiance en cette voiture. je pense qu elle est dangeureuse. Hi Ken, thank you so much for the very informative posts. I purchased a new 2006 4x4 FEH Limited in 2005. I simply love the car (and all the options), but am weary of the brake issues. The tone ring broke at around 30K so the dealer graciously replaced it at no charge. Since then I’ve had numerous “service brake system”, “ABS”, red brake light and “service 4x4”. The dealership replaced some ground wires which temporarily got rid of the light errors. Now I’m at the point of A) try the ABS module-$700 and if that doesn’t work go to B) replace the HCU/Master Brake thingy- $2800. The car now has 130K miles, and I’m simply not in a position to sink $4k into such a high mileage vehicle. I’ve gone a whopping 2 weeks without a service light, but the brakes still grab every now and then. Nothing as serious as the issues reported here regarding use of the emergency brake and such, but the brakes do feel squishy and at times the petal depresses pretty far. I’ve add new brakes and suspension so the “mechanical” brake system is not at all at question. Like you, I live in NoVa and have taken advantage of the HOV excemptions. I’m guessing we may have another year or two tops till they revoke it. I was hoping my car would make it those extra years but that doesn’t seem to be the case. I’ve decided to bite the bullet and am picking up a used Ford Certified 2008 with 71K miles. At least I’ll have another 12 month warranty. I really appreciate the detailed info and complaint links you have provided. Collectively maybe we can make a difference. I have paid dearly for this car and had it religiously serviced only to end up having to ditch it (ps- I’m trading it in as I could not consciously pass this on to potential buyer). Thanks again Ken.. In January 2012, six days after purchasing a used Ford Escape Hybrid from a dealer, my father lost brakes while driving in town. The abs light came on and the brakes had to be pushed to the floor. He drove the vehicle back to the dealer with me following him. The dealer explained to us they did not have the proper equiptment or knowledgable Ford technichians since they are not a Ford dealer. They told us they would have to send the vehicle to a local Ford dealer. The repair involved replacing the entire hybrid system. The next times the abs light went on while either my father or myself was driving we would apply the brakes to make sure we still had proper use of them. The repair seemed to have worked for a while. We decided not to take the vehicle back to the dealer to be looked at since the light would never stay on and the brakes seemed to be in working order. Also, we did not want to be without the vehicle for the lengthy period of time we experienced during the hybrid replacement. The next time the vehicle lost brakes was September 5, 2012. This time the traction control light and the abs light came on. Our dealer sent us to the local Ford dealer and they wanted nothing to do with helping us with the repair cost in order for us to have a safe vehicle to drive. We took the Ford back to our original dealer who ended up installing a new axle. I was shocked that I had to buy an axle. It was something to do with the tone ring being broken and not giving a reading to the speed sensor. The next time the vehicle lost brakes was on September 26, 2012. This time the brakes went completely to the floor and my father had no brakes at all. We had the dealer tow in the vehicle this time. The service shop told us they cleared the codes and could not get the vehicle to reproduce the problem. They sent us home, but not before I got something in writing saying the vehicle was operating as intended at this time. The next day, my father lost brakes while driving to work. Again, we had the vehicle towed to our dealer. We were completely done with the vehicle at that point, but also had to find a way out of the vehicle. The dealer printed a copy of this blog and gave it to my father. They told us our situation was not their problem, but they would trade us into a different vehicle. Financially, we ended up with a large amount of negative equity and larger bills. Mentally, we ended up stressed and frustrated that this vehicle is still on the roads and that Ford still has not done anything to correct their vehicle's serious problem(s). I have been speaking to a local law firm and they need me to find at least six more people besides myself willing to file a class action lawsuit. Is anyone interested? This is our opportunity to inform the public about this vehicle and get the braking systems fixed on the Ford Escape Hybrids before a known death occurs due to its faulty braking system. I own a 2006 Ford Escape Hybrid. I have noticed the efficiency of my breaks is wearing off. As the time pass by I have to hit the breaks harder and harder. So far I didn't have any total brake failure,but now, after reading all this comments, I'm very concerned about SAFETY. I find myself wondering if it isn't related to a fault regenerative brakes system. Should I now expect a total brake failure any soon?? Am I illegible to file a class action lawsuit? I own a 2006 Ford Escape Hybrid, and I too have had problems. Not with the regenerative brakes, but with the keyless entry. 2 months before the warranty expired, the module failed, and would no longer unlock the driver door. It would lock all the doors, and unlock the passenger, plus rear doors and hatch, but not the driver door. FORD wanted me to leave the vehicle, and would not provide a loaner, nor a ride home, which was impossible,as I needed it to get to work. I told them they could have it as long as they wanted once I was on holidays, as I wouldn't need it. They said sure, but by that time the car was out of warranty, and they said there was nothing they could, or would do. So I am stuck with a car that I have to manually unlock with a key every time. I did return the favour mind you, but not buying another Ford, and instead bought a Chevy Volt, and the expierence in driving that car, and the whole customer satisfaction experience is beyond belief. When that single car battery caught fire 3 weeks after a crash test for example. Even though the NHTSA did not order a recall, as it was a rare occurance that occurred several days after a crash, GM voluntarily modified the battery cage on all the cars, gave me a brand new car to drive while they had it. Unbelievable service. I too was a Ford man for several years, but now the General has my business.